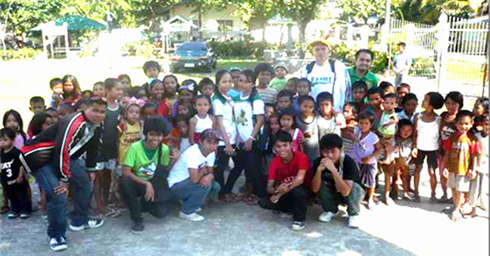 A photo opt with the children of Mulu-Muluan. Residents of Mulu-Muluan, Mercedes, Zamboanga City benefitted from the outreach activity of the Department of Cultural Sciences, College of Social Sciences (CSS), WMSU on December 18, 2010. At least 65 indigent families feasted on canned goods, candies, toys and used clothings. The activity was conducted in cooperation with the Philippine Ports Authority, the Perez and Semorlan clan, and the Anthropology students of WMSU coming from the colleges of Social Work and Community Development, Nursing, Education, and Social Sciences. Likewise, the invaluable support of the following contributed in no small measure to the activity’s success, to wit: CSS Dean Rufina A. Cruz and the following Anthropology professors: Adrian Semorlan, Rochard Tarroza, Roel Borja and Reuben Esperat.